As a mom on the go, you certainly need a few engaging toys and surprises to keep your children entertained. It is not always fun trying to lug around their favorite stuffed animal or their big picture books. So why not get that family that is always on the go something more compact and easy to pack, yet still is a lot of fun for little ones. Kittd has the perfect solution to help you find the best gift for a variety of ages. Kittd are portable, pocketable playsets that are made by moms and designed to keep kids engaged, imagining, and off electronics! Inside each tin is a self-contained activity, designed to spark a child’s creativity and keep them entertained wherever they are. About the size of a phone, On-the-Gos are easy to throw in a purse, pocket, or bag to have ready any time your kiddo needs to keep busy. Anywhere you need some portable fun! Kittd playsets has something for every child. You will find something for the artist, the chef, the builder, and sports fan. These play sets are really phenomenal and I appreciate the tin ((4 1/4″ x 3 1/8″ x 1″) that keeps everything stored in one place. vanGogh On-the-Go: Kit includes a tin with a set of mini crayons, a set of mini watercolors with brush, and a 20-page spiral sketchbook. Table Soccer On-the-Go: Kit includes a hinged tin with 2 rubber soccer figures, 2 pencils, 1 slow-rolling ball (colors will vary), 2 laminated goals, and 1 score book. Rainbow On-the-Go: Kit includes a hinged tin with mini 10-color shuttle pen (outside color of pen will vary), paper, rainbow scratch-off paper, and scratch tool. Puppet Show On-the-Go: Kit includes a hinged tin, 2 hand-made, fair-trade finger puppets (animals will vary), 4 laminated backdrops, and 2 backdrop stands. 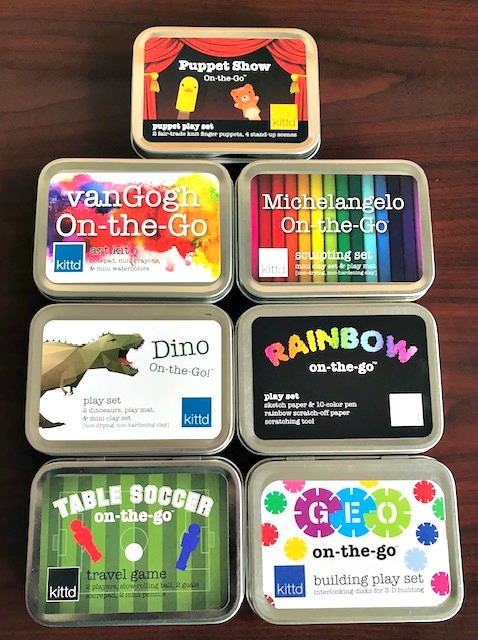 Michelangelo On-the-Go: Kit includes a tin with a set of mini clay in six (6) colors and a 10″ fold-out play mat to protect your play area. Color of the mat will vary. Geo On-the-Go: Kit includes a hinged tin with approximately 30 multicolored notched plastic discs for interlocking building. Forest Friends Tic-Tac-Toe On-the-Go: Kit includes hinged tin playset with tic-tac-toe board inside. 10 magnetic Forest Friend game pieces (5 foxes & 5 owls). Game pieces are 1″ in diameter. Dino On-the-Go: Kit includes a tin with two (2) assorted dinosaurs, a set of mini clay in six (6) colors and an approximately 10″ fold-out play mat to protect your play area. Which of these Kittd playsets do you like the best?